"As someone who is always snacking, and typically snacking on sugar-based delights, the idea of getting a box packed with sweets and candy sent directly to my house was always going to be an attractive proposition. The Super Loot Candy Box does just that. Each month, they send you an impressive selection of sweet and savoury treats to discover and enjoy, but best of all, each item is individually sourced from confectioners around the world, so you most likely haven’t come across them yet either. You get to experience all the tasty goodness that the planet has to offer without having to go through the hassle of getting it shipped over to you! For me, there's virtually nothing more exciting than receiving a parcel in the post, even more so when it's full of sweets! I've already got a couple of other subscription boxes, and I love the whole unboxing experience. Unboxing my Super Loot box takes me back to being a kid in the candy shop again! The excitement of ripping it open and finding what's hidden inside is always something I look forward to. Plus, with Super Loot, no two boxes are the same, so you always get an exciting variation with each new box - it keeps you guessing! On top of all this, you save tons of money! Every box contains an assortment of 10-15 items, including old-school classics as well as the latest array of delicious products fresh on the market. The box contents average out at £35 in retail value, while you pay just £19.99 per box. 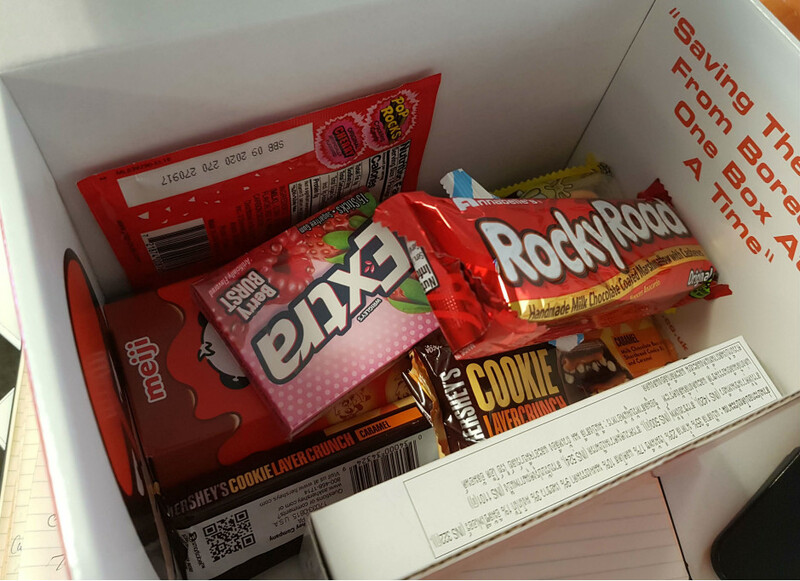 In my most recent box, I got a fantastic selection of sweet and savoury snacks from across the globe including the UK, America and Japan. These included a massive bag of 'TGI Friday's Loaded Potato Skins', a pack of 'Extra Berry Burst' chewing gum, 'Hello Panda' chocolate-filled biscuits, 'Pocky Cookies & Cream' biscuit sticks, an Annabelle's rocky road bar, two 'Hershey's Cookie Layer Crunch' bars, a bag of popping candy, a 'Gummy Krabby Patty Burger', and two 'Refreshers' chew bars. I was stunned with the vast variety and the sheer number of items included in my first box, I already can't wait to see what I get in my next box, which I am sure won't fail to impress. I think one of the best things about the Super Loot Candy Box is being able to taste candy from such a variety of different countries and cultures as it's all sourced from producers around the world. Before trying the Super Loot Candy Box, I was ignorant to the astonishing variety of candy that the world has to offer, but now I can safely say that I’m genuinely enlightened and don’t plan on cancelling my subscription anytime soon. While it's ultimately down to personal taste, I can confidently say that every single item in my box tasted terrific and I've already discovered an array of sweets that I never knew existed, and probably would have never had exposure to. To summarise, with an average RRP value of £35 and the box costing only £19.99, I feel it represents excellent value for money if you're really into your sweets and candy - like myself. You can't put a price on convenience either, so having the products researched, sourced and delivered to your door every month for less than £20 is so good. To put it simply; if you are a lover of the sweeter things in life (and you like a good deal while you're at it), then the Super Loot Candy Box is most definitely the subscription box for you - get stuck in!" Satisfy your sweet tooth and chow down on the tastiest premium candy brands from the UK and beyond. Chocolate or chews, Super Loot Candy box has something for you. Shop now!